Life insurance is a contract between an insurer and a policyholder in which the insurer guarantees payment of a tax-free death benefit to named beneficiaries upon the death of the insured. The insurance company promises a tax-free death benefit in consideration of the payment of premium by the insured. A key purpose of life insurance is to provide financial protection to surviving dependents (spouse and children or grandchildren) after the death of an insured. It also has business applications, for example, protecting investors or lending institutions against the default of a loan to a business, funding a buy/sell agreement, or providing protection to the company in the event of the death of a key employee. Several forms of life insurance are available including, term life (temporary coverage for a term of from 10 to 30 years, as well as permanent life: universal life, indexed universal life, traditional whole life, and other forms. Term life is intended to provide coverage for a limited period of time. 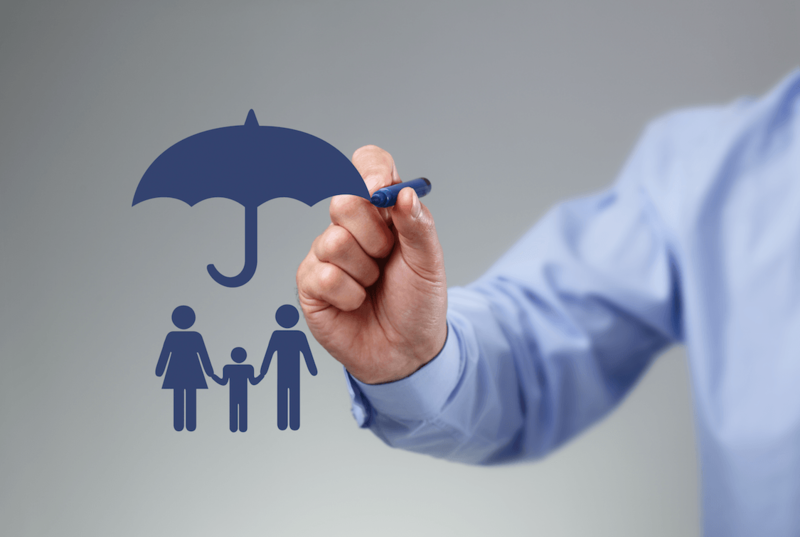 If the need for coverage is going to be longer, then it is crucial to purchase a term policy from a company that will guarantee conversion to any form of permanent coverage available. Moreover, some term policies will provide the ability to withdraw a portion of the death benefit as a living benefit in the event of a terminal illness, a chronic illness (one requiring the need for long-term care), a catastrophic, life threatening illness, or a catastrophic accident. Universal life is like term insurance with a fixed interest account attached. Indexed universal life is like universal life with the addition of several indexed linked accounts which pay out a capped percentage of a market index such as the S&P 500, or an uncapped percentage with a spread (a small percentage fee). Traditional whole life insurance credits cash value as well as dividends (return of excess premium and company profits) much like stock dividends. In effect, the owner of a traditional whole life policy is a partial owner of a mutual insurance company and even has voting rights just as stock owners do. Most permanent life policies will provide the ability to withdraw a portion of the death benefit as a living benefit in the event of a terminal illness. Some policies will extend the same access in the event of a chronic illness (such as would require long-term care). A very few policies will extend this same access further in the event of a catastrophic life-threatening illness or injury. Because of these differences in the details of each policy, it is wise to look into life insurance as carefully as you would look into buying a car or a house. 1. Death Benefit is the amount of money the insurance company guarantees to the beneficiaries identified in the policy upon the death of the insured. The insured will choose their desired death benefit amount based on estimated future needs of surviving heirs. The insurance company will determine whether there is an insurable interest and if the insured qualifies for the coverage based on the company’s underwriting requirements. Term life has a fixed death benefit. With permanent insurance, the death benefit can either be level or it can increase, depending upon whether the insured wants to accumulate higher cash value, or a higher death benefit. 2. Premium payments are set using actuarially based statistics. The insurer will determine the cost of insurance (COI), or the amount required to cover mortality costs, administrative fees, and other policy maintenance fees. Other factors that influence the premium are the insured’s age, medical history, occupational hazards, and personal risk propensity. The insurer will remain obligated to pay the death benefit if premiums are submitted as required. With term policies, the premium amount includes the cost of insurance (COI). For permanent policies, the premium amount consists of the COI and a cash value amount. Universal life has a flexible premium structure. Whole life has a fixed premium. In all types of permanent insurance, the policy can be overfunded to build the cash value higher over time. 3. Cash value of permanent insurance is a component which serves two purposes. It is a savings account, which can be used by the policyholder, during the life of the insured, with cash accumulated on a tax-deferred basis. Some policies may have restrictions on withdrawals depending on the use of the money withdrawn. The second purpose of the cash value is to offset the rising cost or to provide insurance as the insured ages. It is prudent to re-evaluate life insurance needs annually, or after significant life events like marriage, divorce, the birth or adoption of a child, as well as important changes at a business that would warrant changes in the policy. Life insurance agents are instrumental in assessing needs and establishing the type of life insurance most suitable to address those needs. Talk to a knowledgeable agent about what is best for you. Tell them what your goals are, and learn how a good life insurance policy can help you to achieve them.